Hire a Photobooth in Broome! If you’re having any event in Broome, then photobooth hire should definitely be on the list! Broome’s spectacular natural environment and tropical climate provide the perfect backdrop for weddings and events here on the peninsula. Whether it is a Cable Beach wedding, birthday party, school or corporate function, if you want to Hire a Photo booth in Broome we can compliment your event perfectly and keep the party happening all night long! We love to travel so we can also look after your photo booth hire in Derby, Port Hedland, Karratha and even out to Kununurra, so don’t hesitate to get in touch. G’day, and welcome to our beautiful North West corner of Australia. We’re Rick and Ian Sinclair and proudly own and operate In the Booth photobooth hire in Broome. We love the Broome lifestyle and if you’re local to Broome you’ll probably recognize us as our family has been in the Broome and Pearl Coast amusement and event scene for many years. We’re excited to support our local community and provide Australia’s premier photobooth hire service in our unique and beautiful Pearl Coast region that we call home. Whilst it can be challenging to find unique and quality entertainment options in our remote location, that’s certainly not the case with In the Booth. If you’re looking for a fantastic photobooth experience for your wedding, party or any other special event across the Kimberly Coast, please get in touch. "Thank you very much for the wonderful job you did at our special day! We have received our digital image folio and we love it! Our guests and friends love the highlights reel that we shared on Facebook and have made so many positive comments about how awesome the photobooth was. I am sure you will get plenty of recommendations from our wedding guests (as well as us!). Our day was magic, and thanks to you, many of the memorable moments where captured. Thanks again for the fantastic memories." "We all had an absolute ball with In the Booth, Brad and I are so happy we did it!! What a great last minute decision! Thanks for your great service and for making our wedding even more special." 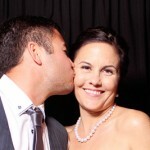 What is it you love about providing photo booth hire in Broome? We may be biased locals, but we reckon there’s nothing quite like a wedding with a view of a Cable Beach sunset. The colour of the Indian Ocean combined with the pinks and oranges as the sun dips into the sea is unrivaled. Our tropical lifestyle fits the events scene in Broome perfectly! Tell us about some uniquely Broome touches you have seen at an event? Everything in Broome is unique so it is not hard to for that to translate into the events held here. A Marquee on the lawn at The Cable Club Resort & Spa will have you feeling like you are the only people in the world, while dining under the stunning canopy of trees at The Billi will add that perfect touch of tropical elegance. It doesn’t come much better than that! 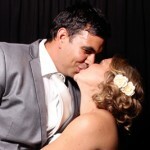 What is the most common question you get asked about photo booth hire in Broome? Apart from hiring one of our incredibly stylish photo booths? Remember to take a breath and savour the moment. Without a doubt, you will have spent many hours planning your perfect event. When the moment arrives, take a look around and remind yourself of what you are celebrating. Anything that may go awry will seem less of a disappointment in the scheme of what you are there to enjoy! When in Broome you must… ? Take the time to savour the slower pace of life. Enjoy long walks along Cable Beach or a spectacular sunset camel tour. Take a tour into the wilderness of the Kimberley – it will quite literally leave you breathless! Take in the history of our local pearl farming industry or visit our local brewery. There are so many things to see and do in Broome, but doing nothing at all is one of the very best choices you could make too!